Garrick's Temple to Shakespeare020 8831 6000work Historic SiteGarrick's Temple was built by the great 18th century actor-manager David Garrick in 1756 to celebrate the genius of William Shakespeare. He commissioned the sculptor Roubiliac to provide a life-size statue of his hero to be placed inside. The recent restoration reinstates the statue in replica and also houses a display illustrating Garrick's acting career and his private life in Hampton. The garden was originally laid out with advice from the landscape designer Capability Brown. Working from contemporary paintings, drawings and nursery lists, the garden has now been returned to echo its 18th Century layout, complete with the serpentine path favoured by designers of the day. Most of the trees, shrubs and flowers featured were also present in Garrick's garden and are a mixture of native British plants, old garden species and plants collected from overseas, particularly America. Garrick's striking little octagonal building and 18th century pleasure garden were restored between 1997 and 1999 under Garrick's Temple to Shakespeare Partnership Project, funded in part by a Heritage Lottery grant and donations from a range of organizations and individuals. 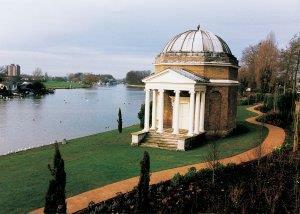 The Temple and its gardens are now managed by Garrick's Temple to Shakespeare Trust, a charity established in 2004 to help conserve the temple, improve facilities for visitors and develop its use for cultural and educational purposes. The Trust has a team of about 40 volunteers. Garrick's Temple was built by the great 18th century actor-manager David Garrick in 1756 to celebrate the genius of William Shakespeare. He commissioned the sculptor Roubiliac to provide a life-size statue of his hero to be placed inside. The temple is open to the public on Sundays between April and October. Gardens open daily all year from 7:30am to dusk. Situated opposite Garrick's Villa on the Hampton Court Road, close to its junctions with Thames Street and Church Street. By water: Catch the Hampton Ferry from Molesey Hurst. A continuous service runs Spring to Autumn. Approach via the Thames Path (Barge Walk) or from Hurst Road turn into Saddlers Ride to large public car park. Public Mooring is available at Bell Hill, in front of the Bell Inn, Hampton side.